1. Preheat the oven to 190ºC, gas mark 5. Line a 12-hole muffin tin with 12 paper muffin cases. 2. Whisk the Flora Buttery with the sugar until pale and fluffy. Whisk in the eggs, one at a time until combined. Fold in the flour and spoon half the mixture into the paper cases. Add a teaspoon of the jam to the centre of each and spoon over the remaining cake mix to cover the jam. 3. Bake for 15-20 minutes until golden and a skewer comes out clean. Allow to cool on a cooling rack. 4. For the icing: whisk the Flora Buttery until pale and gradually whisk in the icing sugar. Add a few drops of yellow and red food colouring at a time to give an orange colour (you will need more yellow than red). Spread over the cakes. 5. 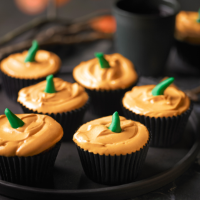 Divide the green icing into 12 large pea shapes and mould each into a thin cone shape for the pumpkin stalks then place in the centre of each cake.